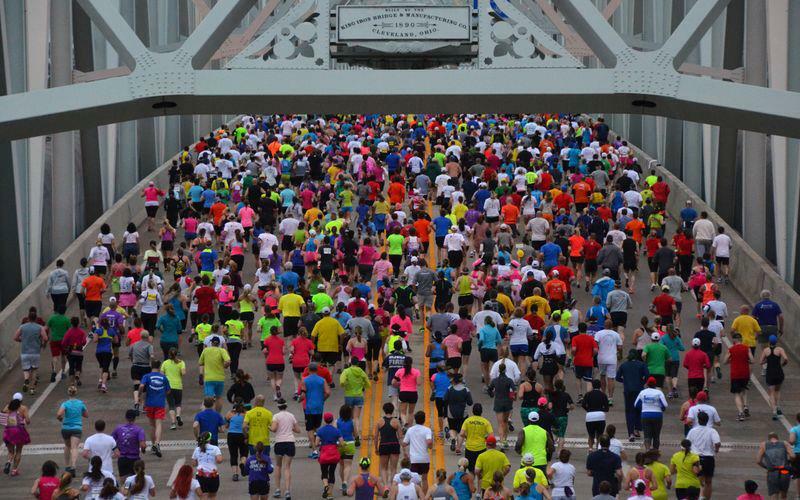 Cincinnati Marathon, Inc., is a nonprofit 501(c)3 organization formed to host a national event, the Cincinnati Flying Pig Marathon, which raises money for charities. The mission of the Cincinnati Marathon, Inc., is to provide a premier event open to athletes of all abilities that is dedicated to supporting charities. The event should inspire community celebration and reward the emotions of all participants, sponsors, volunteers and spectators. The vision of Cincinnati Marathon, Inc.
Fast forward to 1988, when Cincinnati celebrated its Bicentennial. To mark the occasion, the city decided to renovate its riverfront to include a “Bicentennial Commons” park. Noted designer Andrew Leicester was commissioned to design the commons, which was to reflect the city’s past. When he submitted his plans, one signature feature caught everyone’s attention: The entrance to Bicentennial Commons would be four smokestacks, for the city’s riverboat heritage, with four flying pigs on top, reflecting, according to Leicester, the spirits of the pigs who gave their lives so the city could grow. After much outcry among Cincinnati city council members, many of whom donned pig noses to debate whether the swine symbols would make the laughing stock of the country, the project was approved and the pigs became the signature sculpture of the new Cincinnati Riverfront. The pigs live on today at the entrance to Bicentennial Commons. Launched in 2013, the TQL Beer Series served up by the Flying Pig Marathon combines the Bockfest 5K in March, the Fifty West Mile over Flying Pig Weekend and the Hudepohl 14K and 7K events in September during Oktoberfest Zinzinnati. The Queen Bee Half debuted in 2014 with a whimsical ‘bee’ theme celebrating female runners, but guys are welcome, too! The Queen Bee Half Marathon is a female-themed half marathon tour of Greater Cincinnati with lots of fun and food before, during and after! Make it a girls’ weekend in Cincinnati with a “Bee-u-tique” before the event highlighting pampering and wellness, with a fashion show featuring the latest in leisure and sportswear. Learn more at www.queenbeehalf.com.